The value of pipe #214 is n/a points. Susan Thomason offered this pipe in a lot on eBay. 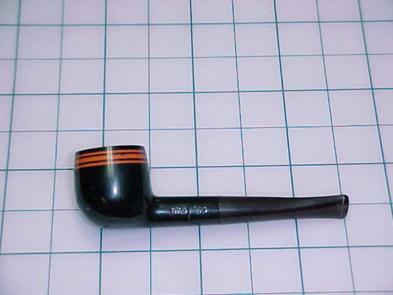 I won the bidding and came into this example of the pipe with Burnt Orange Fashion Stripes. Unfortunately, whoever fitted the replacement stem enlarged the mortise so an original stem cannot be used with it. When Mark Weber offered to trade me a Pipe Rock pipe rest for "a couple of pipes" to smoke, I gave him this one and #252 for it.